The annual 100 mile event is the LDWA’s flagship event. Held every year in a different part of the country, to coincide with the late May Bank Holiday, up to 500 people gather to walk 100 miles in 48 hours. In order to enter all these people will have completed a qualifying event beforehand. The first 100 mile event held was the Downsman 100 in 1973. Since then, with the exception of 2001 when foot and mouth closed the countryside, there has been an event every year. Typically it takes about 3 years to organise a 100 mile event. This feat is undertaken by local groups with the help of supporters, friends and families who put in hours of unpaid time to make the event a success. Success it must be... Depending on the weather and conditions prevailing on the days on the event around 70% of the entrants complete the course. Some will run a large part of the route in say 26 hours, others will take up the full 48 hours to finish. All will have to go through at least one night and possibly two. Checkpoints dispensing tea, hearty food and much cheer (but no beds!) are run by volunteers from local groups and like-minded organisations along the route. A cooked breakfast and a chance to soak feet and change clothes is provided at around the 60 mile point. All completing the distance within 48 hours receive a badge and a certificate and a fantastic feeling of satisfaction. Memories of the pain endured must be very short as many go on to repeat the performance in future years, obtaining their 10/20/30/40 Hundreds badge. 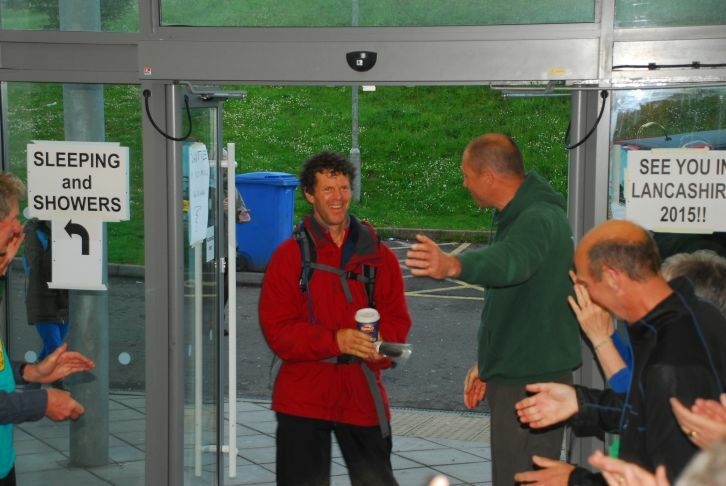 The photo from Steve Clark's selection shows Rod Hollands being welcomed home by Dave Morgan, Organiser of the Valleys 100 in May 2014. Rod walked the route not once but twice, the first person to do so on an LDWA 100! The 2019 event is the Hadrian Hundred to be organised by Northumbria Group with additional support from Cumbria Group. In 2020 the event will be organised by South Wales Group. Y 100 Sir Fynwy will be based on the county of Monmouthshire. The Trans-Pennine 100, will be organised by Vermuyden Group in 2021. Events during 2022, the LDWA's 50th anniversary year, will include the Elephant, Bear and Bull 100. Route descriptions for previous events, together with the results and the certificates have been archived here. Each event has its own unique badge and logo. Badges awarded can be viewed here. The 100 mile event is also amusingly described in ‘Out On Your Feet; The Hallucinatory World of Hundred-Mile Walking’ by Julie Welch. First timers may find it best to read it after they have completed their first 100 miles. Although it is now out of print you may find copies via our Amazon link with a Kindle edition also available (go to the Amazon page and select either the hardback or the Kindle option).